The first week in February, I was fortunate to attend the Western 4-H Institute. While there, I participated in an activity that really got me thinking. Our presenters laid out paper masks and asked us to write down all of the projects that we participated in during our own 4-H careers or program areas that we are putting together as agents. I quickly wrote down the spattering of projects I participated in as a kid without thinking twice. After we shared with those around us, we were then handed a clear piece of film that was shaped just like the mask. We were instructed to write life skills that we gained through 4-H. After completing this, our instructors had each participant hold up the paper mask in front of the transparent piece. They explained to us that most of the time people are only looking at the projects at face value. "Winning the grand champion steer at the county fair is the most important part of the project", one instructor exclaimed as if they were a very excited twelve year- old. We were then asked to swap the paper and transparency. At this point it became apparent that the life skills can be forgotten in the scheme of a 4-H career. My 4-H career was a successful one and helped shape who I am as a person today. At the time it was not obvious to me the multitude of life skills I was gaining through simple tasks like guiding 4-H meeting and camps or taking the time to chat with a stranger who stopped at our pens at a show. These life skills that I gained have afforded me so pretty awesome opportunities not only while I was a 4-H member but also a working professional. It is not until now that, I realize that there needs to be more emphasis on those skills opposed to who won the grand champion cake decorating project the previous year. When you are out working in the barn with your livestock or you are inside perfecting your jelly recipe for the country fair remember the skills that you are really learning. Skills such as responsibility, respect, patience, work ethic, and so many more. Remember that someday that trophy, buckle or banner will collect dust, but the important thing is to hold the skills you learn and the connections you make close to the heart. Don't let the product get in the way of the process! 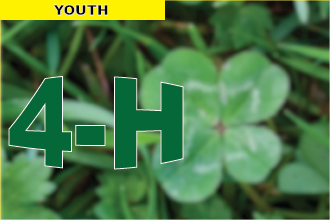 From the Extension Agent’s Desk - Why Join 4-H?